It might be a little embarrassing to confess that I have never heard of the Gruffalo. I mean, my mum never told me any fable, at least not in English, when I was young and even if I had heard of him, I seriously don't remember. So, while I've always liked to bring my kids to the library, it dawned on me that I should perhaps get a little more in touch with popular children's books and improve my mediocre ability in naming famous children's authors. 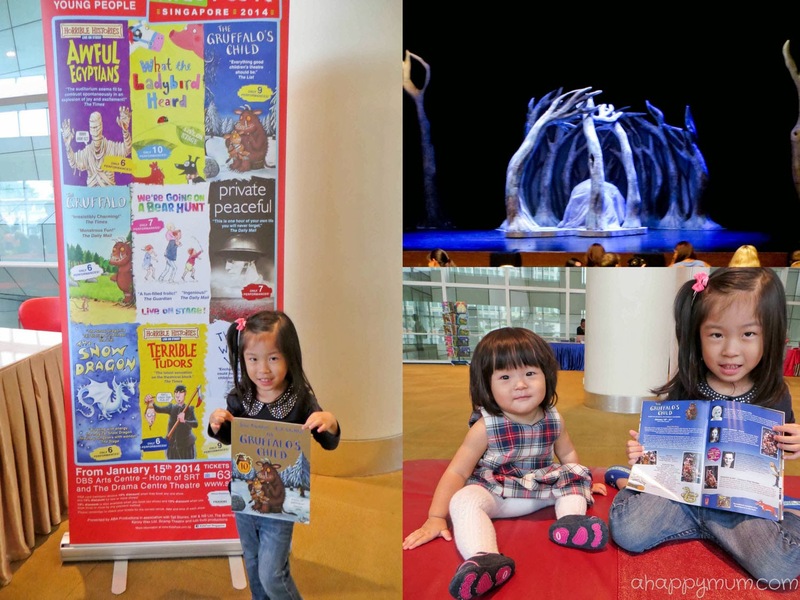 This year, KidsFest runs from January 15th to February 9th with nine international theatre productions adapted from best-selling children’s books. 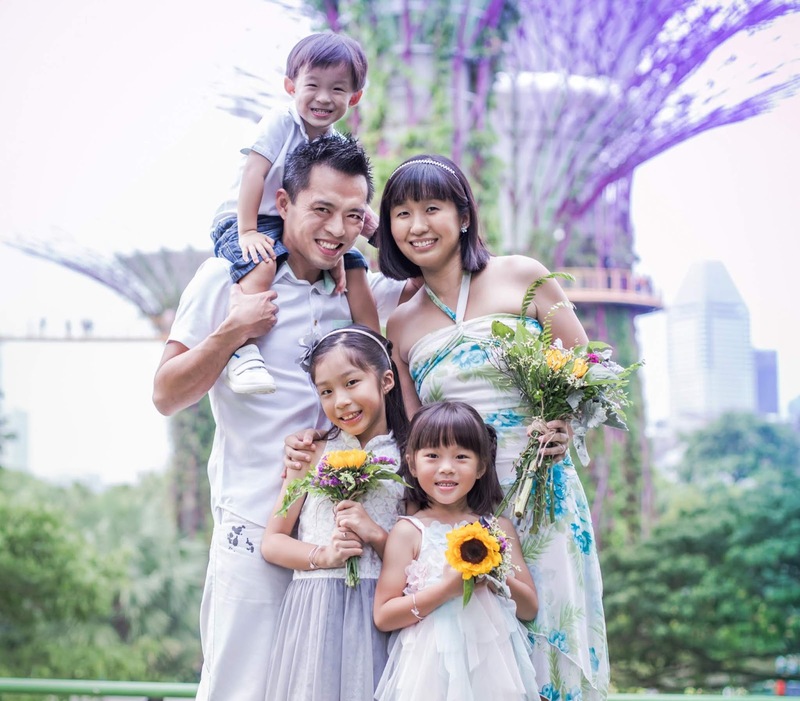 It makes for a fun-filled family experience where storybook characters are brought to life and scenes from well-loved books are enacted on stage. 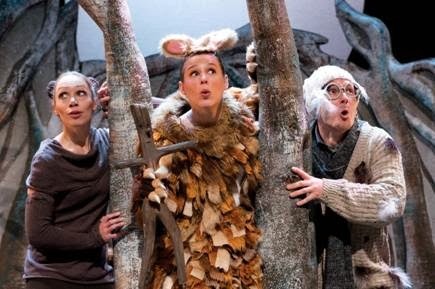 Last week, the girls and I were thrilled to be able to catch the highly anticipated sequel to The Gruffalo, The Gruffalo's Child, at the Drama Centre Theatre in the National Library building. One cold night, the Gruffalo’s Child ventures into the deep dark wood to find the big bad mouse, the one thing her father is afraid of. Despite her father's warning never to step inside, she is determined to find out if the big bad mouse really exists. On the journey, she encounters the snake, owl, and fox. Just when she thinks she will never find the mouse, she meets the little mouse who previously tricked her father, who then re-creates the big bad mouse by using moonlight to project a magnified and scary shadow, causing the Gruffalo's Child to flee back into the arms of her father. This dynamic, musical adaptation brings Julia Donaldson and Axel Scheffler's award-winning book to life. With the show lasting for 55 minutes, I was at first apprehensive if the girls could sit through it. Although Angel might not understand the dialogue at times and I had to explain it to her, she loved the whole story, the animals and was thrilled by the songs and dancing that accompanied the show. Not to mention that baby Ariel would go ecstatic and jump up and down on my lap when the music turned on. 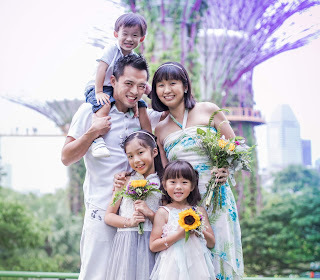 This year, KidsFest also introduces KidsFest+ where the audience can interact with the cast over an autograph or photo session on scheduled dates for selected productions. We patiently waited half an hour for this and Angel was really looking forward to coming up close with the Mouse. Although we were hoping to meet the entire cast, just three of them in fact, we only had the chance to be take a photograph with the Gruffalo's Child. Nonetheless, we gave our best roaring poses and since Angel loved the story so much, I also forked out $16 to buy her a storybook. Titled The Gruffalo's Child, of course. Mouse managed to scare hungry animals away with stories of the terrifying Gruffalo, but what happens when he comes face to face with the very creature he imagines? Join Mouse on an adventurous journey through the deep dark wood. Two crafty robbers with a cunning plan to steal the farmer’s fine prize cow. Find out how one tiny ladybird saved the day and join the woolly sheep, the hairy hog, the fat red hen and the dainty dog on a farmyard adventure. Inspired by the famous Aesop fable, this is a beautiful wintery tale about a boy, unable to find delight in what is around him and instead seeks adventure, excitement and the thrill of the unknown! Billy has everything a young goat could need. On New Year's Eve, Billy's parents tell him about the legendary Snow Dragon, who will bring him even more goodies during the night. Find out how Billy escapes from the wolves in the woods and if the Snow Dragon gives him a present. Tickets are on sale now and prices range from $35 to $62. Book them at any SISTIC outlet, official SISTIC website here or call the hotline 6348 5555. For more information on showtimes and other productions recommended for older children, check out KidsFest website and their Facebook page. Disclosure: We received complimentary tickets to watch the Gruffalo's Child. No monetary compensation was received and all opinions are my own. We love to visit libraries but it is not often that we make our way down to the Central Public Library. 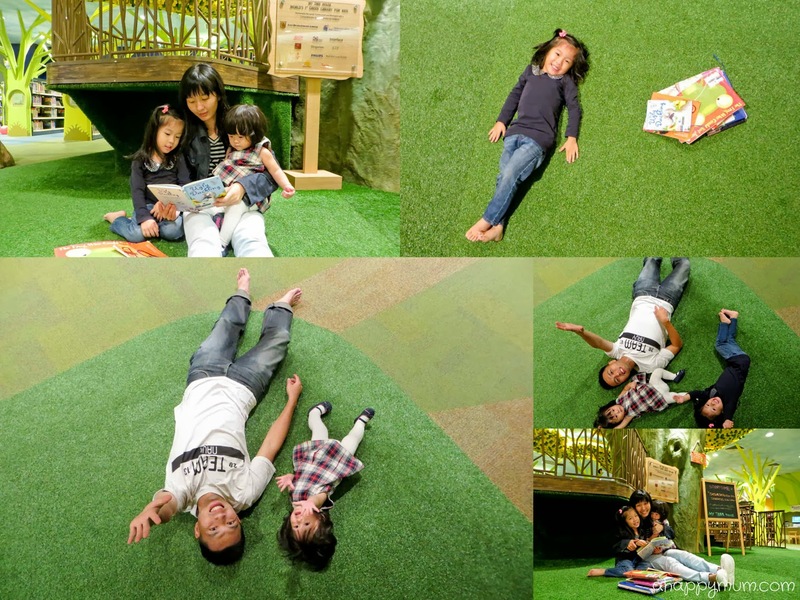 So, since we were in the building that day, we decided to let the kids hang out at My Tree House, the world’s first green library for kids. My Tree House is a unique green library purposefully conceptualised, constructed and operated with environmental sustainability in mind. It houses 70,000 where about 30% of these cover green topics including animals, plants, water resources, environment and climate change. 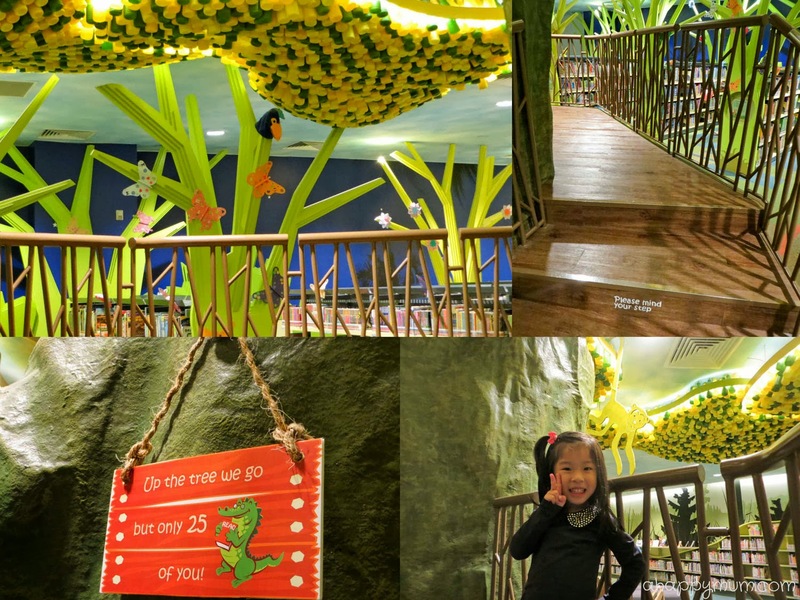 Designed to create an enchanted forest atmosphere, the place takes its name after the centrepiece which is a tree house structure constructed using recyclable materials. It was a weekday evening and we were surprised to see that there was no crowd in the library, which gave us plenty of space and freedom to explore the place. Well, my big girl simply couldn't wait to get to the top of the tree house, which houses maximum 25 guests by the way, while the little one was contented with trying to walk on the lower grounds. I love that cosy feeling of reading to my girls in that quiet, somewhat magical ambience. Why, we could even lie down and try to spot the animals above from bird to monkeys to butterflies. A fun day out, two smiling kids, a happy me. 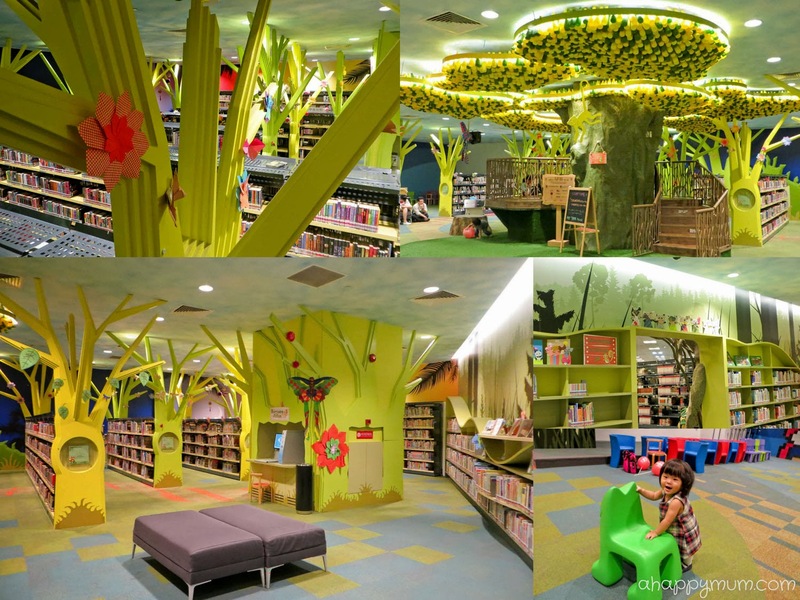 Don't you just love storybooks and libraries? The Central Public Library is located at 100 Victoria Street, Singapore 188064. Opening hours are from 10.00 am to 9.00 pm daily. But thanks for sharing this information on your blog. I will keep an eye for future KidFest. Dear Joanne, thanks much for reading. It is my regret that your girl missed the show. :( we were invited to this rather last minute and I had only a few days to write a post which I had tried to rush asap. I hope you might consider some other shows too, some of them look really good! :) thanks much for writing to me and stay in touch!